Thank you for your recent inquiry. We are so sorry to hear about your loved one's passing. 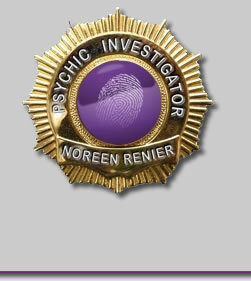 Noreen Renier Appreciates your interest in her intuitive abilities. However, once the police ascribe a death to suicide rather than to homicide, they usually become reluctant to reopen the case, regardless of her willingness to offer her consulting services. Although, in deference to professional courtesy, we decline to recommend some other specific psychic for your consideration, perhaps you can find one that will be able to help you. We wish you success in your endeavors.